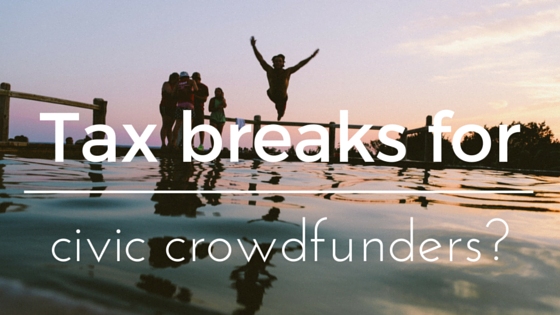 Tax breaks for civic crowdfunders? Could the Government fuel town centre regeneration by offering tax breaks to civic crowdfunders? Last week, leading property and retail firms joined Spacehive and other stakeholders to explore how civic crowdfunding could be harnessed to revive town centres. The Secretary of State for Communties, Eric Pickles, hosted a roundtable attended by firms like John Lewis, Lloyds Bank, Deloitte and Grosvenor; public funders like Big Lottery Fund and Bristol City Council; and inspiring entrepreneurs behind Spacehive projects like The Liverpool Flyover. The discussion was lively as attendees “stress tested” ideas for businesses, local authorities and the public to collaborate on exciting projects of mutual benefit. Much of the talk was around how companies and councils could matchfund projects popular with the crowd. But ideas for new functionality were also explored – like a proposal to crowdsource rewards from the community to incentivise people to fund projects. Pickles suggested that crowdfunding, essentially a technology-fuelled revival of the Victorian-era concept of public subscription, could bring about a dramatic shift in the balance of power towards communities. One idea triggered something of a collective light bulb moment in the room: the suggestion that the Government could relax the rules around claiming Gift Aid (currently only applicable to charities and sports clubs) to encompass civic improvements. That would add 25% to the value of every pledge to a new playground, park, or public WiFi network – a big incentive for local people and organisations to invest in their area. The tax break wouldn’t come cheap but the idea is being followed up, so watch this space!